Let’s Get Wet! | So, You Think You Can Teach ESL? This week, my class started the chapter on water in science. It covers the water cycle, and the tides. Since the chapter is a little short, I am spacing it out by covering each major topic with more depth. I want my students to have a strong understanding of how the water cycle works, and how the tides work, and to explain each concept in detail. Luckily, the water cycle is easy enough for them to explain each step in order, and also tell why it’s important. I recently gave my students an assignment that consisted of a short reading, comprehension questions, and a writing activity. 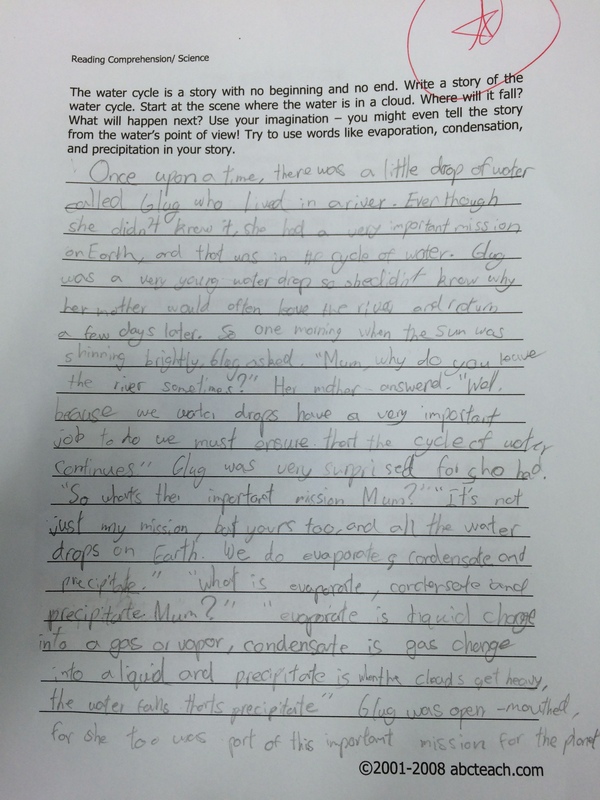 This writing activity instructed the students to describe the process of the water cycle through a story. One student wrote about it from the perspective of a young raindrop, named “Glug”. While her English is not perfect, she does effectively talk about each step, and the importance of the water cycle. This activity is excellent for developing science and writing skills, and lets students have fun, too!